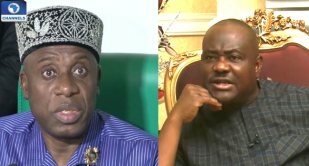 The Minister of Transportation, Rotimi Amaechi on Tuesday slammed River State Governor Nyesom Wike over the New Year attack on the state blaming him for encouraging thuggery. Some gunmen on Monday morning unleashed mayhem in Ogba, Egbema, Ndoni Local Government Area of the Rivers State when they opened fire on residents who were returning from a midnight service. At least 16 persons died in the attack. Amaechi in his reaction to the attack, on Tuesday, blamed Governor Wike for encouraging thugs and failing to safeguard the lives of the people of his state. Amaechi, who is also the former governor of Rivers State made this reaction while addressing State House correspondents after an audience with President Muhammadu Buhari at the state house, Abuja. Governor Wike has however placed a bounty on the perpetrators, promising to reward anyone who can identify the perpetrators with the sum of N200million. The Minister of Transportation also spoke concerning the commissioning of more coaches to boost rail transportation and a possible increase in fares to be paid by passengers across the country.